For travellers seeking something a little different from a visit to the Island, The Grove offers a fantastic opportunity to experience the traditional culture and abundant wildlife of this region. Whilst staying at The Grove you will experience the most peaceful way of life interrupted only by the noise of peacocks calling or beautifully coloured birds singing in the trees. There is an abundance of wildlife around the estate which is a bird watcher paradise. You will have the opportunity to experience life in a working Coconut Estate but with all the modern luxuries of comfortable beds, AC, en-suite bathrooms, large swimming pool and private chef to cater for all your needs. Enjoy traditional Sri Lankan rice and curry or a BBQ in the evening by the pool in beautiful surroundings by lantern light surrounded by jungle which is a perfect way to unwind after a day's tour. Or perhaps you may like to sample a dish cooked in our traditional wood burning stove which is perfect for Pizza, Bread baking and roasting meat and fish in traditional Sri Lankan style. Enjoy this unique experience and rare opportunity to taste authentic and healthy Sri Lankan baking. The staple food for Sri Lankans together with rice is the Coconut. If you wish to get involved we will teach you some delicious recipes with coconut both savoury and sweet to take a taste of Sri Lanka home with you. Start from scratch by plucking the coconut from the tree, removing the husks and cracking open the nuts. 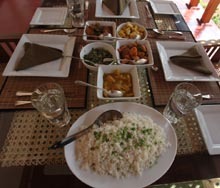 Our chef will also show you and explain the ingredients that make Sri Lankan food so delicious.